I have just signed up with Orcon for VDSL to now be told that I am on a waiting list. The Eta for the planned connection date is about a year away. Is their anything i can do? 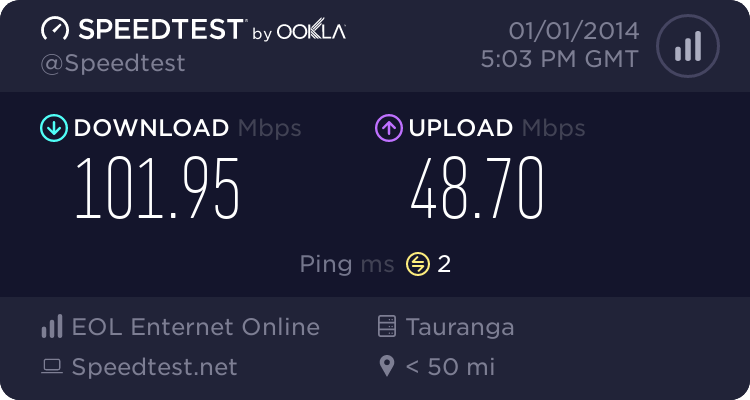 Do you have ADSL at the moment or is this a new connection and you have nothing? I have just moved into a new apartment. So i have nothing. I just spoke to someone at orcon and they said it makes no difference. if it was me and it was one of the 50+ DSL connections i look after, i wouldnt take orcons word for it, i would call an ISP like Snap and ask them to do a double check theres an ADSL port waiting list at your location, where are you based? Yea that was my thoughts exactly. Is Snap a more reliable ISP? I am based in Albany Auckland. I was under the impression that VDSL-capable cabinets have a 1:1 mapping of ports to properties, so this surprises me. It's definitely worth trying another ISP, and although I don't have any experience with Snap the reviews on Geekzone seem to be pretty good. Edit: I'd mixed things up a little; see nakedmolerat's post below. All of the VDSL linecards may be in use, but there should be sufficient ADSL ports for every property. sbiddle mentions this in the past - vdsl port waiter - yes, but there shouldn't be any adsl port waiter. i recommend BigPipe, get the request done online. they are pretty good (but they don't have phone for customer to contact). Behodar: I was under the impression that VDSL-capable cabinets have a 1:1 mapping of ports to properties, ........... but there should be sufficient ADSL ports for every property. Isn't the slot in the xDSL cabinet the same, whether you have ADSL or VDSL? It's a matter of plugging in the A or V card to get one or the other. After speaking with someone from Snap they tell me that they cant see any reason why I would be on a port waiters list. So i guess the only thing to do is wait? id be more inclined to believe snap, this is what i would do to get some sort of internet asap, i could cancel the orcon order (making sure they actually do cancel), order ADSL with SNAP, once ADSL has been up and running, id ask SNAP to upgrade to VDSL. if there is an actual waiting list for VDSL, atleast you will have adsl in the meantime instead of nothing. yeah it's possible, but in my experience so far pretty unlikely. I'm yet to see a customer who was a VDSL waiter that was ALSO an ADSL waiter. rxwan: I have just signed up with Orcon for VDSL to now be told that I am on a waiting list. if your going naked DSL id also choose bigpipe over orcon ;) im sure the bigpipe guy would also check your address and see if orcon is full of it.